Choosing the right fertilizer – Johntheplantman's stories, musings, and gardening. 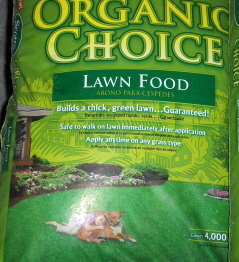 How do I choose the correct fertilizer? “What do I feed my plants?” “What is the best fertilizer?” — I think that in my experience as a plant man, these are the most frequently asked questions, and everyone seems to want a concise, three word answer. Here’s the concise answer: “It all depends.” Read on to learn how to choose the best fertilizer for your particular needs. Basic 10-10-10 fertilizer. What do the numbers mean? 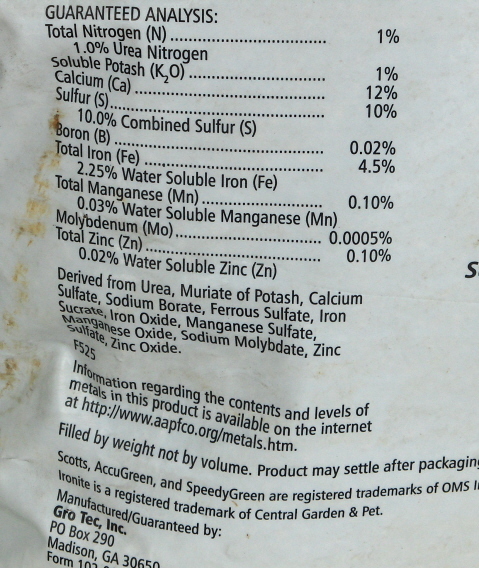 I will approach the topic with a series of pictures of fertilizer labels and an explanation. 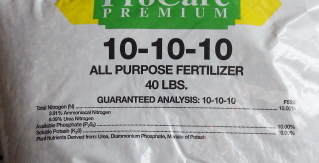 The most widely used (and usually cheapest) product used is the basic 10-10-10 fertilizer pictured above. 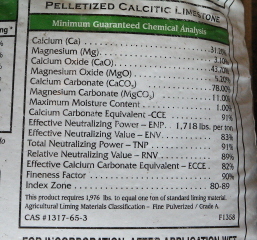 All fertilizer bags will have a complete analysis of ingredients. This one shows us that we are getting 10% nitrogen (N), 10 % phosphorous(P), and 10% potassium(K). This means that 30% of what is in the bag is actual fertilizer; the rest is filler. N, P, and K are the symbols for the chemicals from the periodic chart of the elements. Basically, nitrogen promotes green, vegetative growth, phosphorous helps the plant to develop a good root structure, and potassium promotes blooms. Vegetable growers know that if you put too much nitrogen and not enough phosphorous and potassium on the plants, you will get beautiful plants but the fruit production will be diminished. Grass growers know that too much of the last two numbers and not enough nitrogen will not produce the desired results for them. Note: If you are dealing with centipede or St. Augustine grasses, do some research, they are different. A well formulated fertilizer. Note the inclusion of trace elements. 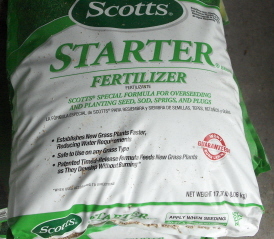 Note that this starter fertilizer for lawn seeds and sod includes high nitrogen (18%) for the green, vegetative growth, high phosphorous (24%) for developing root growth, and relatively little potassium (6%) because blooms aren’t really necessary for turf grass. As a corollary, one of the best plant foods for tomatoes which is no longer available was Dr. Chatelier’s plant food which contained an analysis of 8-8-20 plus trace elements. It also grew magnificent roses. 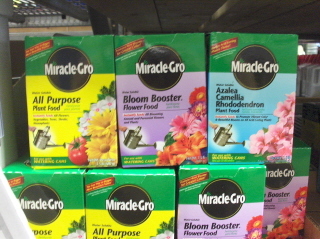 I have always tried to find a fertilizer like this for use on vegetables and flowering plants. There are some products with this or a similar imbalance on the market—they’re just hard to find. Remember, the numbers don’t have to be exactly the same, just the ratios. Organic, Anyone? Check the numbers and the source on the back of the bag. 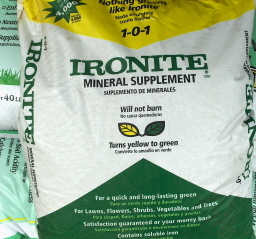 There is a wonderful product called Ironite. The need for iron shows up as a yellowing in the foliage. This happens commonly with gardenias. One time, a little old lady gardener (she was little, and definitely old, and she wore white gloves in the garden, but names will not be mentioned because she would slap me) told me to sprinkle Epsom salts around the roots of the yellowed gardenias. It worked. Ironite does it even better. Look at all the good stuff in this formulation. Last year when Sweetie asked me to fertilize the grass, all I did was put lime on it. The grass was greener than ever!! One of my favorite and most often used fertilizers for ornamentals is Osmocote. This is a time release fertilizer that breaks down over a period of 6 months or so and offers continuous feeding of the plant. 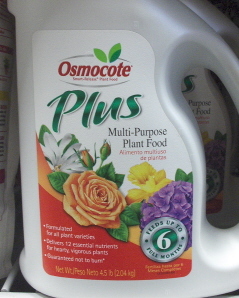 I use a time release fertilizer whenever I plant flowers or shrubs. It gives good results. 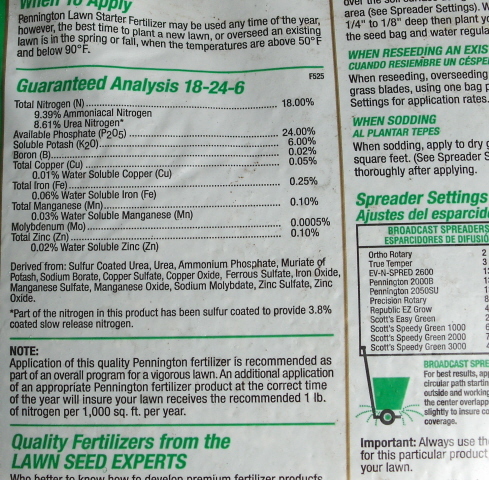 There are many time release fertilizers on the market, so you can compare the ingredients on the label. Always be sure to work the time release fertilizer well into the soil. These products usually come with a formulation for either flowers and vegetables or for foliage plants. Read the label. Tree spikes are a very effective product for feeding your prized trees. These are made to be driven into the ground around the “drip line” of the tree and they feed it throughout the growing season. There will be different formulations for regular trees or for fruit and flowering trees. I like to poke a hole in the ground with a digging bar before driving in the tree spikes. It keeps them from breaking. 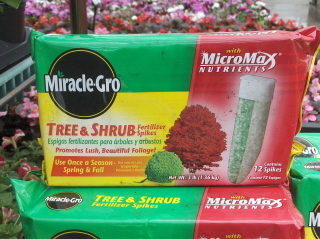 Professional greenhouse growers usually use a liquid feed for their plants. A lot of these growers use the liquid feed at every watering. I personally like to use it every week or two during the growing season. There are many brand names, Peter’s, Schultz’s (no relation, note the t.), Miracle grow, and many others. The liquid feed fertilizers come in a number of formulations. Here again, read the label. If you are a serious plant grower, you may need several different kinds. Remember—“SHOOTS, ROOTS,FRUITS”—(first number, middle number, third number). I always liked Peter’s 20-20-20, but I can’t seem to find it any more. There are many brand names and many more formulas. Read the label. As I was finishing up my exploration of the fertilizer section at Lowe’s garden center, I noticed a fragrance that is common to the hills of north Georgia. 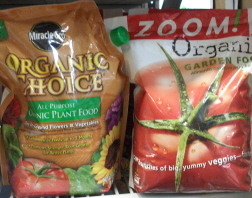 I looked around and found two different brands of Organic Fertilizer. Not to be used for making chicken soup. 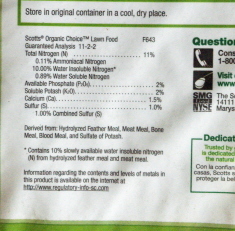 I read the label and found that it was composted chicken feathers and manure—and it was only $8.98 for a 5 pound bag. A little rich for my blood in more ways than one. Takeaway: 1. Read the label. 2 Shoots, Roots, Fruits. 3. The three numbers stand for percentages of nitrogen, phosphorous, potassium (NPK) in that order. 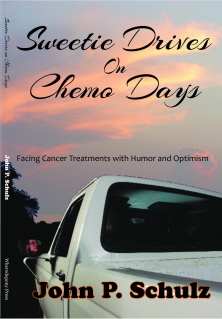 Johntheplantman appears in the book Requiem for a Redneck, by John P. Schulz. Now you can go to Amazon and see inside! Any questions about fertilizer? Leave a comment. Building a flagstone walkway and garden entrance—part two. Dang! Johntheplantman has done wrote a bang-up article on s%$@. Most excellent. Pingback: 10 steps for seeding a new fescue lawn in the fall | Johntheplantman's stories, musings, and gardening. Pingback: Prune Azaleas in May-June. Fertilize Azaleas, Avoid and Kill Poison Ivy | Johntheplantman's stories, musings, and gardening. Pingback: 5 Steps For An Easy, Accurate Way To Apply Liquid Fertilizer | Johntheplantman's stories, musings, and gardening.